Well this is interesting. 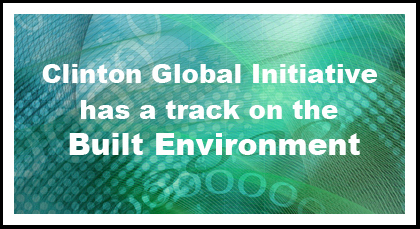 Holly Bik pointed me to the fact that the Clinton Global Initiative has a track on the Built Environment:About Us: The Built Environment | Clinton Global Initiative. Not sure exactly what they do in this track but seems like a good way to get exposure for the field of microbiology of the built environment would be to get the CGI people to include discussions of microbes in their next meetings. My experience about 6 years ago with the CGI was related to estimating buildings’ impacts on anthropogenic greenhouse gas emissions (GHG). I had been charged with developing a scientifically defensible approach. It was suggested that I contact them because it was said they were doing something similar. I found their approach light on scientific validity and heavy on simplicity, publicity and politics. There is value to calling attention to an issue, but if it is to promote science, then there has to be respect for and value to scientific endeavors.